In January 2018, three Associates spent a few days in the Williamsburg, Virginia area in order to uncover more information about the Ludwell family, to pursue possible projects with other research partners, and to determine whether archaeological research can shed more light on the existence of lay Eastern Orthodox worship in colonial America. Here’s our report. Still Intriguing: Was ‘Structure S’ an 18th-Century Orthodox Chapel? 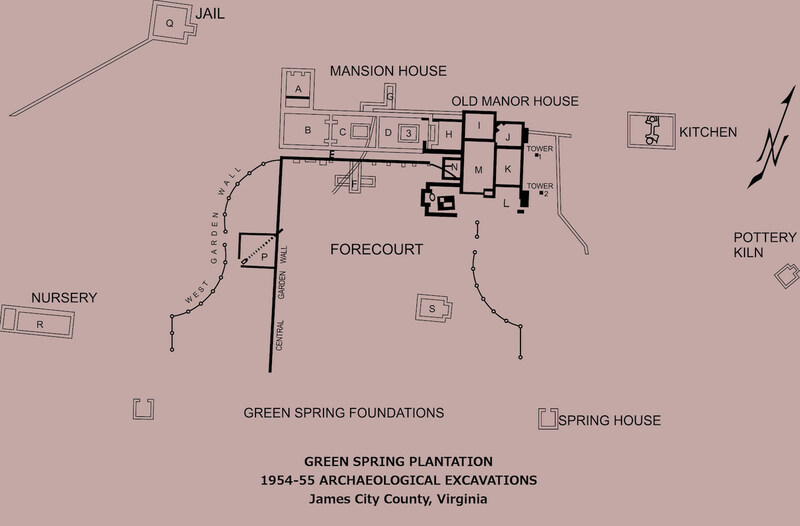 Map of Green Spring plantation’s 1954-55 archaeological excavations, performed by Louis R. Caywood. 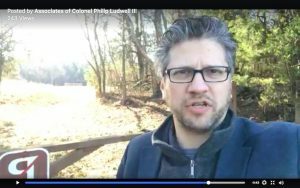 One aspect of Philip Ludwell III’s life is clear: he was intimately familiar with Eastern Orthodox prayers, having translated multiple works and liturgies into English from Greek. In addition, Ludwell’s writings indicate that he considered prayer to be an important aspect of everyday life. In other words, he appeared to have led a prayer life based on his own translations. Given that it was common for plantation owners of the era to hold or lead prayer services at home (with parish churches too far away for weekly Sunday travel) it seems a reasonable assumption that there was some form of lay Orthodox Christian worship at Ludwell’s Green Spring plantation. 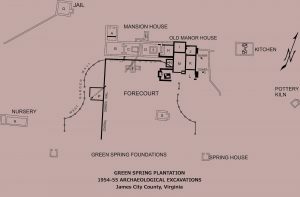 Green Spring lies five miles west of the capital of Williamsburg and a couple miles north of Jamestown which not only was the first permanent English settlement in America, but also was Ludwell’s constituency in the colony’s House of Burgesses. Deacon Nicholas Dujmovic, in a blog post titled “Seeking Archaeological Evidence at Green Spring’s Structure S”, provides a more complete report on our efforts to uncover possible archaeological evidence of Orthodox worship at Green Spring, specifically at a structure labeled ‘S’ in the 1950s archaeological excavations. With guidance from the National Park Service’s research staff and archaeologists with experience at Green Spring, he discusses ways that we could pursue uncovering material evidence of Eastern Christian worship. Could a Virginian from Mount Athos really have welcomed the Marquis de Lafayette to Norfolk in 1824? The answer to this odd question is: yes. 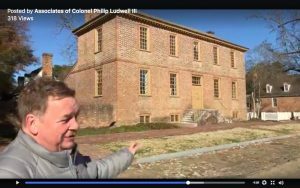 After that event, Lafayette journeyed to Williamsburg where he dined at the former townhouse of Philip Ludwell III (now known as the Ludwell-Paradise House) with a man named James Lee who appears to have been a leader of an Orthodox Christian community in the Williamsburg area at the time. Lee had married into a distinguished French family called Bellett who had briefly lived in Canada before coming to Williamsburg, as did Viscount Philip Ignatius Barziza, who was the great-grandson of Philip Ludwell III. Learn more in our video. It is generally known that the Ludwell family, beginning with Philip Ludwell I, inherited the renowned Green Spring mansion and plantation which was formerly owned by Sir William Berkeley, who as royal governor of Virginia in the 1600s had a profound influence on the development of colonial Virginia. 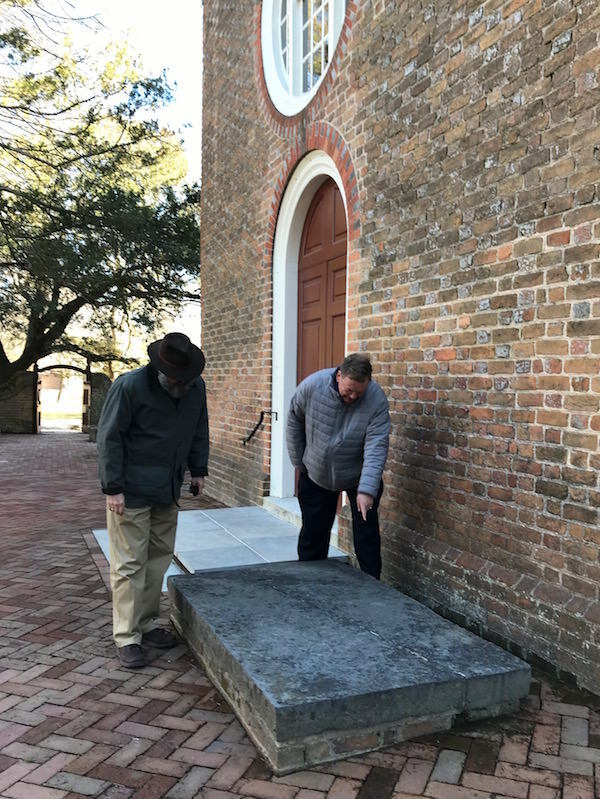 Nicholas Dujmovic and Nicholas Chapman examine the grave of Thomas Ludwell at Bruton Parish Church, whose name honors the ancestral home of the Ludwells in Somerset, England. What is not generally acknowledged is that the Berkeleys and Ludwells hailed from the same area in the county of Somerset in southwest England, and were related. The town of Bruton is in Somerset. Students and graduates of the College of William & Mary and others who are familiar with Colonial Williamsburg will recognize this as the name of the famous Bruton Parish Church in the former colonial capital of Virginia. Still a functioning parish, Bruton Parish Church’s current structure was built in the early 1700s to rival the stature of parish churches in London. Bruton Parish Church was founded in the late 1600s with the support of Thomas Ludwell, who was sent to Virginia by the Berkeley family along with his brother Philip Ludwell I. Thomas served as secretary of the colony, clerk of the General Court, and president of the Royal Council. His brother Philip was buried at Stratford Bow Church to the east of London in the early 1700s, where his own grandson Philip III was also buried following his death in London in 1767. 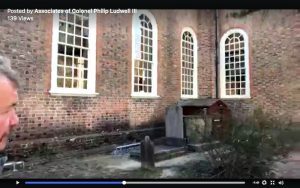 For more information and to see where Thomas Ludwell is buried at Bruton Parish Church, watch our video report. 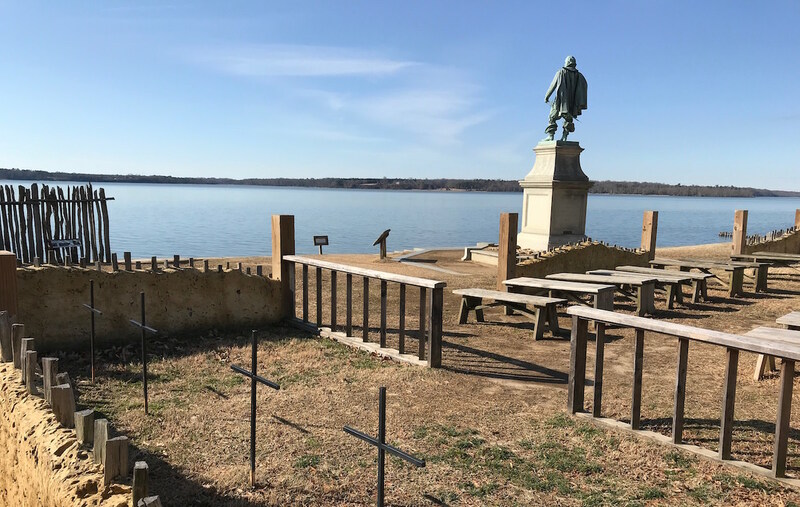 Top photo: Historic Jamestown showing the location of the original Protestant church. In the chancel in the foreground, colonist Gabriel Archer died in 1609-10 and was buried, surprisingly, with a silver reliquary. Pocahontas and John Rolfe were married at this location. Jamestown was Philip Ludwell III’s constituency in the House of Burgesses, and his parents, son-in-law, and grandson are buried in the churchyard not far from the location in this photo.